When one travels frequently there’s a tendency for the details of one trip to lapse into another. It’s easy to remember a handful of very special moments, of course, and I will long remember the magnificent landscapes of places like Chile, Jamaica, Puerto Rico, Guatemala, Italy, Tahiti and the dozens of other countries I’ve visited over the years. But after spending 20-plus years sailing aboard cruise ships, sleeping in different hotel rooms, flying in planes and walking around airports, the details sometimes run together. That’s one reason I’ve gathered a collection of travel mementos and souvenirs in my home office. I have paintings, photographs, carvings, reproductions and even a trophy sitting there, all treasures of varying commercial value that double as priceless reminders of some wonderful travel experiences. 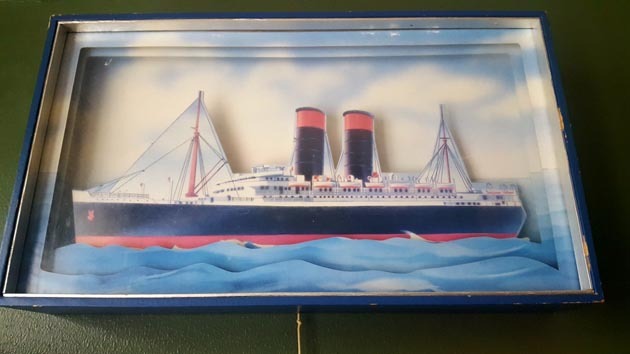 There is one item that, while treasured, is something of a mystery to me as I can’t say exactly where I obtained it: a trans-Atlantic ocean liner diorama. Encased in a bright (naturally) blue box, the cut-out liner features generalized but indeterminate livery and the two smokestacks typical of transatlantic era ships. The vessel floats on an ocean of cardboard waves and when a string extending from the bottom of the box is pulled, it plays “Anchors Aweigh” as the ship bobs about the cardboard sea. It’s as charming a souvenir as I’ve ever come across and for me a fitting reminder of a period during which I embarked on more than 100 cruises. Another item is a laminated poster that depicts a 1934 issue of a travel trade publication for which I worked years ago. 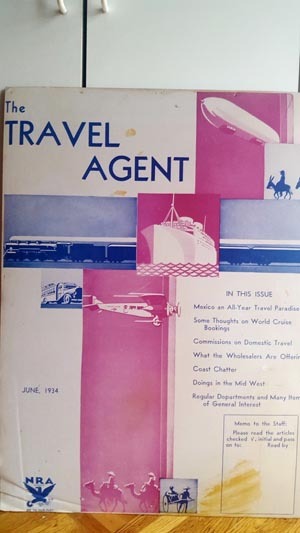 The cover reveals the magazine’s existence coincided with a now-bygone travel era, as the hand-drawn images include a steamship, a railroad train, a propeller-powered passenger plane and a dirigible. PHOTO: Travel magazine cover from a bygone era. Yet surprisingly the cover’s sub-headlines refer to articles that reflect contemporary leisure travel concerns including “Mexico an All-Year Travel Paradise,” “What the Wholesalers are Offering” and “Some Thoughts on World Cruise Bookings.” Change sometimes occurs quite slowly. The 1999 adoption of the euro as Europe’s primary currency made a variety of currencies, from French francs to Italian lira, obsolete. I managed to keep dozens of what I assume are now-worthless yet still artistically intriguing bills, placing some in frames. They’re great to look at and complement other photos with friends and colleagues near the Champs-élysées, in St. Marks’s Square and in front of the Church of San Domenico in Taormina, Sicily. 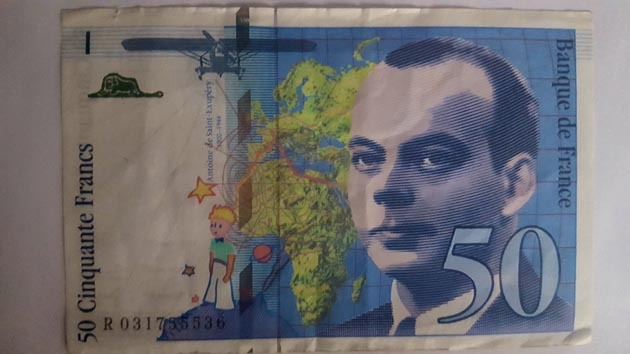 PHOTO: French franc featuring Antoine de Saint-Exupéry, a French writer, poet, aristocrat, journalist and aviator. There are items from recent travels, like a replica yole boat from a wonderful visit to Martinique this past summer, and from journeys completed long ago, like the leather-bound whisky flask I received as a gift aboard one of my two flights aboard supersonic Concorde jets before their 2003 retirement. One of my favorites, however, is a simple 5” by 7” color photo of me standing on a dock in Malaga, Spain in 1993. In the background in a now-forgotten ship, Cunard Line’s “Cunard Princess.” The ship was relatively old and devoid of the myriad facilities and amenities found aboard today’s cruise vessels. Yet that sailing would be one I recall fondly to this day. It was my first to the Mediterranean, which years later remains my favorite area of the world to cruise. Moreover, I had an absolute ball with the small group of fellow writers, several of whom I remain friendly with to this day. It was an ideal way to launch what for me was a new career covering travel. I’m glad I still have some reminders of that wonderful time.